Signing your first professional contract is always a special moment for any footballer but for Daniel Heffernan, it was something he never expected to do at the age of 28. Heffernan is recalling when all his hard work in Australia finally came to fruition. Having been a semi-professional footballer back home for the likes of Altrincham, the striker continued the work/football balance down under for three years before his big chance finally arrived when he agreed a one-year contract with A-League side Central Coast Mariners. A spell in Indonesia was also to follow but it was in Australia where his professional dream began. “I was asked to upload my details onto a football CV website by a man called Tony, who was a non-league football fan following FC United of Manchester. He had seen me play and mentioned to me about the site he created to try help get exposure for non-league players overseas. Heffernan’s first club in Australia played in one of the many regional state leagues which are below the country’s professional A-League. He was offered a two-year deal but after impressing with his performances during his first year, big clubs higher up the league pyramid came calling. He eventually signed for second-tier side Heidelburg United but despite the move, it was not all glamour for the forward from Manchester. Any work commitments certainly did not get in the way of forward’s time with Heidelburg as he embarked on a prolific three-year spell with the club which saw him make national headlines. In the country’s national cup competition, the FFA Cup, he scored the fastest goal in cup history when he notched after just 26 seconds in a win over Sydney United. The goal came as no surprise though with the former Salford City man having scored fifty league goals during his time with the National Premier League (NPL) side. “I had a good few years at Heidelberg and was lucky to be in one of the top teams in the league that were solid and created enough for me to get a good goal return from games,” he says. His incredible goal return not only caught the attention of media outlets across the country but also clubs from the A-League and eventually he was handed a trial by Central Coast Mariners but it was something that Heffernan wasn’t expecting, despite the fact that he had been one of the leading goal scorers outside of the A-League for three years. “I was never really aware of any A-League clubs being interested in me as I knew that being a visa player [A-League sides are limited to the number of foreigners they can sign] your options are very limited with making that step up from NPL,” he says. “The first interest shown by Central Coast was after Tony Walmsley (the then CCM manager) had been in Melbourne watching NPL games to look for players to trial the upcoming pre-season. Heffernan was now 28 but in the form of his life and he carried his remarkable goal scoring record at semi-professional level into his trial with the Mariners. He scored a hat-trick in a friendly against Western Sydney Wanderers and that was enough for him to be offered a one-year deal. The previous highest level the forward had played at was in the Conference back home with Altrincham but now he was a fully fledged professional after agreeing a deal with the A-League side. Unfortunately for the forward, he joined Central Coast ahead of what would be their worst season in recent history as the club finished rock bottom with just three wins all season and Heffernan admits it was difficult to make an impact. 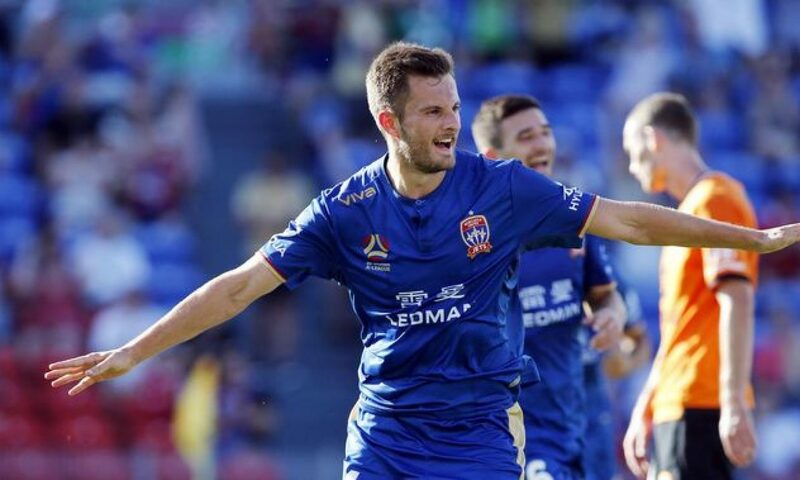 “After my first start [a 1-1 draw away to Newcastle Jets], I felt I had done well enough to have a shout of keeping my place but a formation change meant I had to be dropped. “Given how bad the season was for the club it was hard for me to get a look in throughout. I had worked hard to improve my fitness level but it was never going to be easy to make an instant impact in games when I was short on match fitness. “I do think I could have made the step up though, as I wouldn’t have moved up there if I didn’t believe I was good enough. The Manchester-born striker was limited to just seven league appearances all season in a difficult year for the Mariners which saw Walmsley sacked. Heffernan also left the club after his only season with the club but another move abroad soon materialised for the forward after he had identified where he wanted to take his career next. “Indonesia came about after a chat I had with my CCM team-mate Francesco Stella and his time over in Asia [Stella had previously played in Thailand]. I mentioned I wanted to get out there and play so he put me in touch with his agent. He had contacts with the owner of Bali United and they were holding trials and wanted me to attend which I did. Heffernan joined Bail United during an uncertain time in Indonesian football. After the top-tier of Indonesian football, the Super League, was suspended after the 2015 season, a new competition called the Indonesia Soccer Championship was hastily formed to take its place in 2016 whilst the top-tier was reformed for the following year. The Englishman joined partway through the season and instantly noticed a difference in the style of play. “The football there is very different,” he says. “The local players are very fit and run all day long but just lack that bit of football knowledge. Everything was at one hundred miles per hour and my team trained the same way everyday day and never mixed it up, which showed in games. Despite the uncertainty surrounding Indonesian football at the time, Bali still pulled in an average home attendance of 10,000 and even attracted over 20,000 fans for one of their games, a huge increase of what Heffernan had previously been used to. The former Altrincham striker settled in well and enjoyed his time in Asia initially but after seven appearances and a disagreement with Indra Sjafri, the club’s manager, his time with Bali was over at the end of 2016 season. Since leaving Bali at the end of 2016, the now 31-year-old has had a brief spell in non-league football back home but he now has his sights set on another move abroad. “I’m not sure what the future holds, to be honest,” he says. “I’m thinking of possibly looking at coaching badges but that would be purely to look at something overseas again rather than in England. Although Heffernan’s stint in professional football may have been short, no-one can say it was undeserved. Having worked alongside playing for most of his career, his shot at the big time was something that he will forever be proud of and there are not many of us out there who would say no to the very same opportunity. Despite that, the forward from Manchester still has a sense of what might have been.